Electing Faithfulness: All Hail the King! BECAUSE JESUS IS STILL KING, Y’ALL! He was King yesterday, he’s King today, and he’ll be King tomorrow. I am a kingdom heir in a kingdom made of King Jesus and his bride, the church. In the kingdoms of men, men kill other men in the name of false peace and false security. In the Kingdom of Christ, the King died to give you true freedom, and doesn’t ask you to kill anyone else. He asks you to be willing to die, but to die is gain in this kingdom! In the kingdoms of men, people are sometimes expected to vote for a leader, and told this frees them. 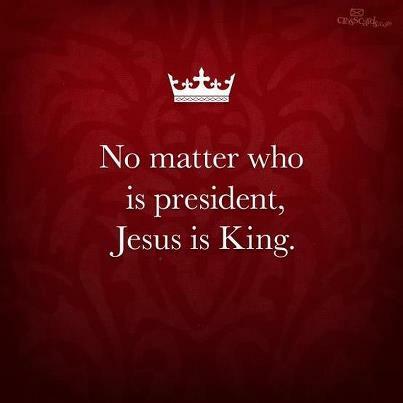 In the Kingdom of Christ, King elects you! In the kingdoms of men, you must salute a flag, which becomes withered and moth-eaten. In the Kingdom of Christ, you salute one another! In the kingdoms of men, you are told you have rights and duties. In the Kingdom of Christ, you are told you have salvation and blessings! In the kingdoms of men, power is established by men. In the Kingdom of Christ, everything is upside down! In the kingdoms of men, they march to battle hymns. In the Kingdom of Christ, we jump for victory hymns! In the kingdoms of men, you revenge your enemies. In the Kingdom of Christ, you love them! In the kingdoms of men, evil is overcome with evil. In the Kingdom of Christ, evil is overcome with good! In the kingdoms of men, those who live by the sword die by the sword. In the Kingdom of Christ, we wield the sword of the spirit, piercing the marrow of the soul to bring new life! In the kingdoms of men, a wise man is helpless because he will be in the minority. In the Kingdom of Christ, a wise man’s foundation is built on the rock! In the kingdoms of men, no nation is godly. In the Kingdom of Christ, God built his Kingdom! I knew that no substantial victory would come from this event they call an election. Was this depressing? No! It was freeing! For I do not have to trust in these schemers. In fact, I am told not to. It’s becoming easier not to as I grow older. Jesus is my King, indeed. Love him or hate him, he’s the king. This entry was posted in Faith and tagged 2012, Christ, Christian, church, election, Jesus, King, kingdom, President, voting. Bookmark the permalink.